Note: If upgrading from an earlier version of ProEssentials, first remove the ProEssentials components from the Delphi/Builder IDE before proceeding. If your RAD Studio has both Delphi and Builder Personalities, install into the Delphi version. Our setup does not copy our 64 bit DLL, PEGRP64G.DLL into the 64 bit Windows System dir (System32). To use the Delphi 64 bit platform, copy PEGRP64G.DLL from the ProEssentials install folder/x64 subfolder to the 64 bit Window System32 folder. After setup completes, use the Delphi menus File / Close All and then File / Open to open the file "GIGASOFT.DPROJ" found in the C:\ProEssentials9\Delphi directory. You will see a project pane as shown to the left. 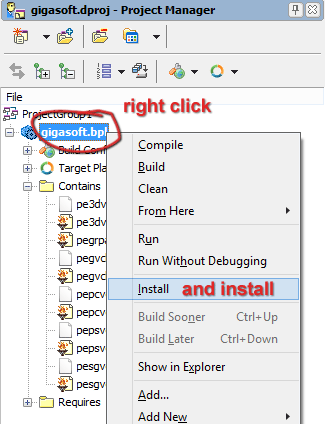 Right click near the top "gigasoft.bpl" and select Install. The PAS interfaces are compiled and ProEssentials components installed into the "Additional" tab. We provide the PAS source incase you want to tinker with the interfaces.